A: Mon-Sat : 09:00 - 18:00, Sun : Closed. 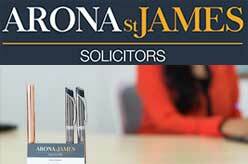 Arona St James Solicitors is a law firm in East London offering Divorce & Family law advice, Corporate and Personal Immigration law services etc. More than 20 years of experienced, and deals with complex cases of all types family matters including separation, divorce, cohabitation, matrimonial finance, private children law matters etc. London E17 7PJ, United Kingdom.